Paint booths pose a high fire risk because of work done inside with flammable and combustible materials, which leads to fast-spreading and high-toxicity fires. 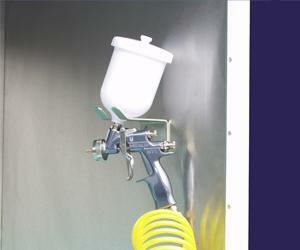 The accumulation of airborne vapors and paint dust creates an extra risk due to the danger of explosions. The high temperature generated internally during drying processes also increases the risk of ignition. Since they are considered high-risk enclosures, booths must meet certain safety requirements to prevent accidental fires. The focus is on reducing ignition and explosion risk factors such as the booth controller, the ventilation system, etc. But the primary focus is deploying a firefighting system that acts quickly and effectively to minimize damage. Extinguishment by total flooding or local application. The ability to accommodate personnel.